Spring and cleaning are intertwined. In earlier centuries, spring cleaning meant sweeping out the mud, bugs, ashes and other debris from an open fireplace that provided heat and light. There was also smoke and trash from a family that cooked, ate, slept and used indoor personal hygiene facilities while trapped indoors by the weather. These days, cleaning means more than just throwing out the old and scrubbing windows. Thanks to the popular book and TV program by Marie Kondo, organization is the key. “Kando-ing” has become a word for the trend, but it’s more than going out and buying boxes and bins. Vintage pieces can be repurposed into clever, stylish storage. As a bonus, this approach can be inexpensive. 1. Wire or woven baskets. Remove any rust or grime on the metal wire with steel wool, then wash and dry. Wash the woven baskets, empty out any water then shake the basket to get rid of the residue stuck in the weave. Gently wipe and leave the baskets, away from the sun, until they dry. The soaking is good for a basket. They crack and crumble if too dry. Put some baskets in corners where scattered toys or unfinished sewing projects, magazines, even clean and folded laundry can eventually be carried to a bedroom and put away or used. 2. Old drawers. Sometimes old dressers can’t be salvaged. Save the drawers. Put them on their sides and screw hooks on the inside top. Hang horizontally and use the hooks for necklaces, bracelets and other jewelry. 3. Vintage suitcases. 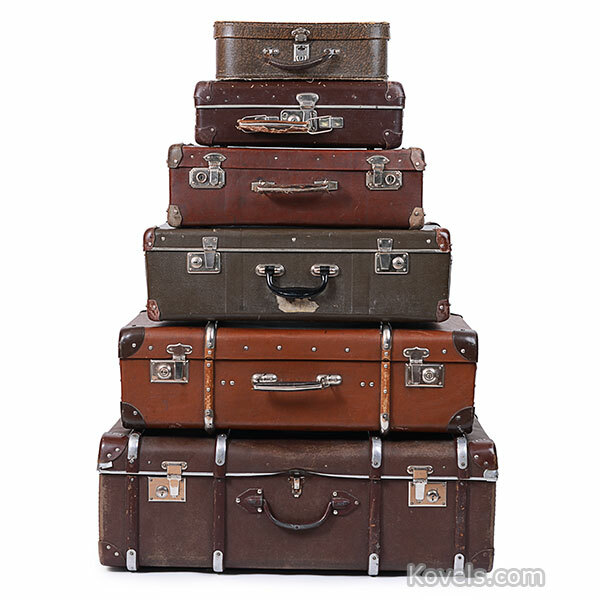 Look for similar suitcases in different sizes. They can still be spotted at a Salvation Army or other second-hand store. Clean them inside and out. If there is an odor, fill the suitcase with a few pieces of charcoal in a pierced plastic bag or a sachet. Pack with out-of-season clothes, linens, or even purses. Stack them or store them under a bed. There is a modern (and expensive) piece of furniture that is group of suitcases held together at different heights by ropes. 4. Wooden crates. Find some old wooden orange crates and put caster wheels on the bottom. They suddenly are mobile storage for craft supplies or toys. Bonus – think outside the box. We once bought the vestment cabinet from a church that was being demolished. It’s built into our office. There are 16 large drawers that are perfect for storing posters.